Landmines and other unexploded weapons cause horrific damage. 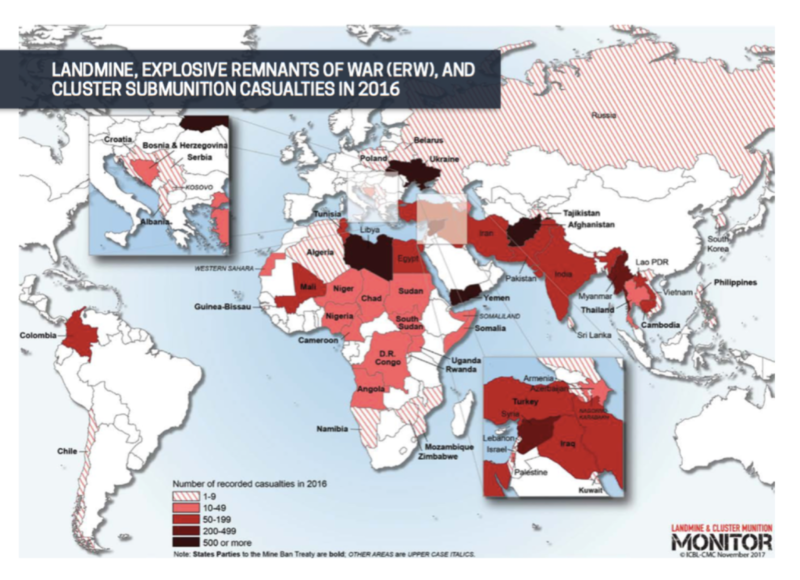 The World Health Organization (WHO) estimates that 26,000 casualties are caused by landmines or unexploded ordinances (UXO). Roughly one in four of those victims die as a result (Source), and those who survive often have injuries such as lost limbs that trouble them for the rest of their lives. But injuries and deaths are just one of many types of damage that landmines cause. Landmines are obstacles to construction of essential services, farming, and irrigation. Unicef notes that if a child’s mother is affected by landmines, his or her physical well-being is affected; and when a father is affected, children are often forced out of school so that they can work to support the family. If a child lives through a landmine-induced injury — approximately 85 percent die before reaching a hospital — they will most likely be pulled out of school. This cuts down future prospects for education or employment and causes the family to perceive the child as an additional liability. Finding these landmines is a challenge. The currently affordable technology for locating land mines – metal detectors – does a poor job. Hovering over the ground with a metal detector not only puts the person maneuvering at risk of injury or death; it also is a slow and inefficient process. The detector will find literally 1,000 pieces of metal that aren’t an explosive for every explosive it does find. Every suspicious piece of metal located requires the person to investigate, slowing down the process. Alternatively, dogs are expensive, harder to transport, and heavy enough to set off mines. However, rats may give room for hope: more specifically, the African Giant Pouched rat. That sentence sounds funny; rats get a bad rap for sticking their noses in places we don’t want them. However, the African Giant Pouched rat has been saving lives by using their acute senses of smell to sniff out landmines. These “HeroRats” have very poor eyesight. But what they lack in vision, they make up with their noses. Their keen sense of smell allow them to detect even the tiniest whiff of TNT. To find the landmines, the rat is trained to walk on a leash. That leash is attached to a bar that moves across a suspected field. Once the rat smells TNT, it marks the location by scratching or biting the area. Because these rats weigh between half a pound and three pounds, they do not set off the landmines, avoiding catastrophe (Source). These rats are also much faster at finding landmines than human minesweepers. In 20 minutes, a single rat can search over 2,000 square feet. That same area would take humans up to four days. For the past twenty years, APOPO has been training these rats to help clear out hidden landmines. During that time, HeroRats have helped APOPO destroy 107,725 landmines and clear out 22,699,534 square meters of land. Nearly a million people have been saved from the threat of explosives, and APOPO has no intention on stopping there. Currently there are 115 rats trained by APOPO that are hard at work building safer communities and futures. How can you help this wonderful organization? Adopt a rat! See here for more details.